A new light on Florence in springtime. Why not profit from the good season for a short holiday? 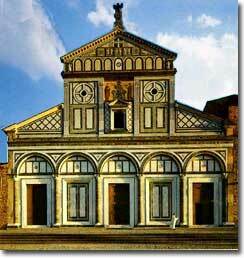 Look at the apartment in Florence or the Tuscan villas offered by Tuscan Holiday Rent. Savour the mild weather, strolling along the Arno river or make your way up to Piazzale Michelangelo to get the best view of the town spreading in front of you, under the sun setting or otherwise visit the Romanesque San Miniato al Monte at the end of the day, when Benedictine monks sing Vespers. But remember to be before 19,30 in Via dei Macci 111rosso, in a very amazing place called Teatro del Sale for an excellent, reasonably priced dinner: a gorgeous buffet of fresh pastas, grilled meats, sautéed vegetables and all kind of salads, all accompanied by generous Tuscan wine. You can help yourself with the tapas-style dishes set out on a large table after the chef has announced what is being served, continuing to fill your plate until the evening show starts. In fact at about 9.30 p.m. the place magically turns into a stage for evening performances, ranging from Gershwin to Macbeth. 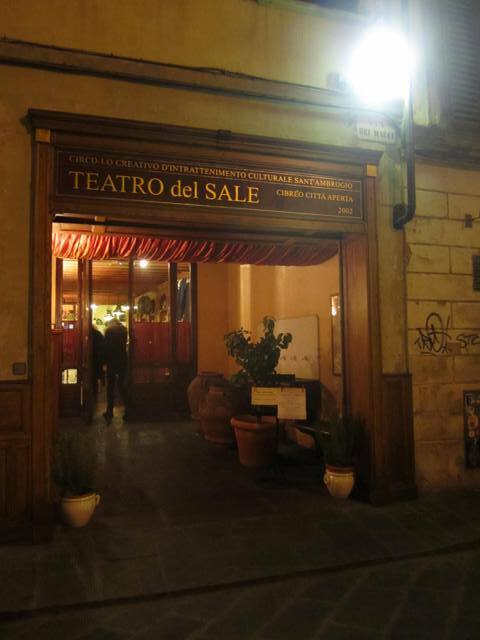 That is the Teatro del Sale, a successful combination restaurant-theater, unique, quite a lot of fun. What you need is a membership, being it a club. Five euros per person to get a card valuable for a year, which allows you to drop here at any time and have breakfast, lunch or dinner. Everything works great. The cunning minds of this place are the chef owner Fabio Picchi and the actress Maria Cassi, a couple in work and life. To each of them their respective domain. Mr Picchi, not easy to be defined, is in turns entrepreneur and poet. He is surely genial. He inaugurated in 1978 the Cibreo, a cult restaurant, drawing his name from a Renaissance dish. A café and grocery store were added in 1989 and finally in 2003 a cultural club” the Teatro del Sale” . It is an on-going lab of cooking and theatre, an original mixture of something outside the beaten tracks. As a writer, Picchi proudly interprets, in one of his several books, the ten commandments of cooking, a sort of philosophy meant to find out the laws of the authentic traditional dishes. Maria Cassi , a professional actress, is the artistic director of the pieces staged at the Teatro del Sale. Last year she conquered the French with a sold-out show ”Crepapelle” (being in stitches) at the Théatre du Rond Point in Paris. The piece moves from Fiesole, in the surroundings of Florence, to Paris focusing on hilarious stories, brushstrokes depicting both Florentine folks and unconventional Parisians. Maria, continuously moving from Florence dialect to her personal French, wears on the stage different masks, playing different characters, elderly homeless, charming women, mature men. The audience is steadily captured. According to the French newspaper Le Monde, the actress recalls Charlie Chaplin, Jerry Lewis or Jacques Tati, thanks to her witty sense of humour, always swinging between laughter and emotion, her playing on words and comic verve interspersed with dramatic qualities. At the moment she is in the States in Broadway, New York, with an autobiographical musical about her Italian and Florentine Dolce Vita called “ My life with men and..other animals” produced by Peter Schneider, the guru of Disney successes like The king Lion, Roger Rabbit and the Beauty and the Beast. 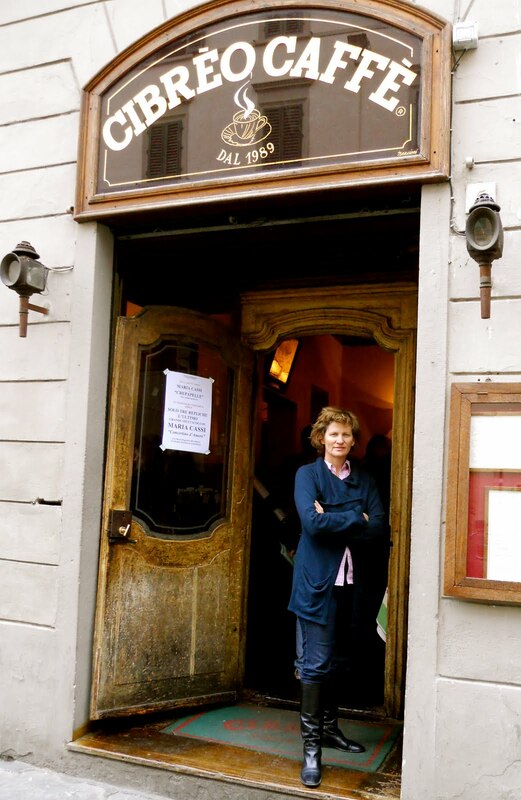 Peter Schneider himself remembers the meeting with Maria at the Cibreo when in Florence for a language course. Four years ago, in winter time, he met the woman who embodied the best of Tuscany: wine, food, sun, light and art , but above all, the freedom to be simultaneously silly and wonderfully human. In spite of his poor Italian he was charmed -as he says- by the performances of the unique magical, mercurial, fascinating Maria Cassi at the Teatro del Sale among wine, food and gestural conversation. That’s the genesis of the musical on show in Broadway on March the 15th 2012.